There was a very quick turnaround from arriving back in Seefeld on the Monday night to then leave again on the Wednesday. It was good to have very large National team with two full vans of skiers and gear. The first race on the Friday was a skate sprint and after my race in Otepaa I was keen to have a good one and get some low points again. It was a fairly long tough course of about 1600 metres with cold slowish snow so I made the effort to go out of the more conservative side to avoid blowing and hopefully come home strong. This worked fairly well as I felt I didn’t lose bulk amounts of time in the last third of the race like I often do. I ended up qualifying 16th, 13 seconds behind the winner with my best FIS points so far of 112 so I was pretty stoked about that. In the heats I wanted to make it through to the semi’s as I’ve never done this before in Europe so I went out aggressively and wasn’t going to get boxed out like I did in the German cup not that long ago. I had a sweet start and got into second heading up the main hill. I sat comfortably up the hill along the flat and over the top but then two or three guys passed me on the gradual down so I tried to lay down the law and bring them back in, but then as if a switch had been flicked I went lactic something chronic. Going up the last hill I tried to give it some but unfortunately I was past it by then and skied across the line with what felt like an acid party in my legs. Calboss and Mark Vandy skied solidly in their heats and were unable to go through despite being a lot closer to the front than I was. Esbot had a good one coming in in 2nd place! PK, Tutty and Calboss also smashed out their best FIS points to date so a good day was had by most. I was pretty stoked the distance events this weekend were both 10km races instead of 15km, the shorter the better I reckon. It was a 10km classic on the Saturday with a solid course with well varied terrain. I was starting to feel a bit on the sick side and was wondering how I would end up going. As it turned out it seemed my sickness hadn’t ventured down to my lungs yet and I could ski at near 100%. 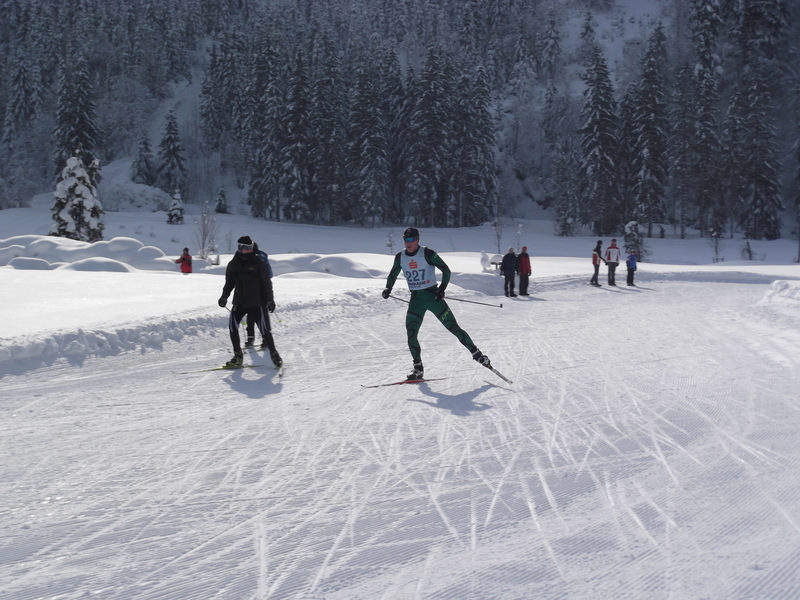 10km races are always painful and I today was no exception, I turned myself inside out to go as hard as I could to the point of almost blowing and was quite happy with the way I skied. I ended up with 134 FIS points which was O.K. Warming up on the Sunday for the 10km skate with a pursuit start I was feeling quite flat and lethargic with my slight sickness possibly taking some energy. I was lucky enough to start only one second in front of another skier, this was good as I tried to get a sit on him and hang on. This worked well for the first three quarters of a lap but after working really hard on a steep pinch to hang on I was tipped over the edge and blew up with lactic acid. With around 6km left to drag myself around I tried to minimise the time I was rapidly losing while having an acid party in my legs. Overall I was pretty happy with the way the weekend ended up going but I am pretty keen for a rest from racing although this won’t come for a little while as we have four days until another three days of straight racing in Campra next weekend. 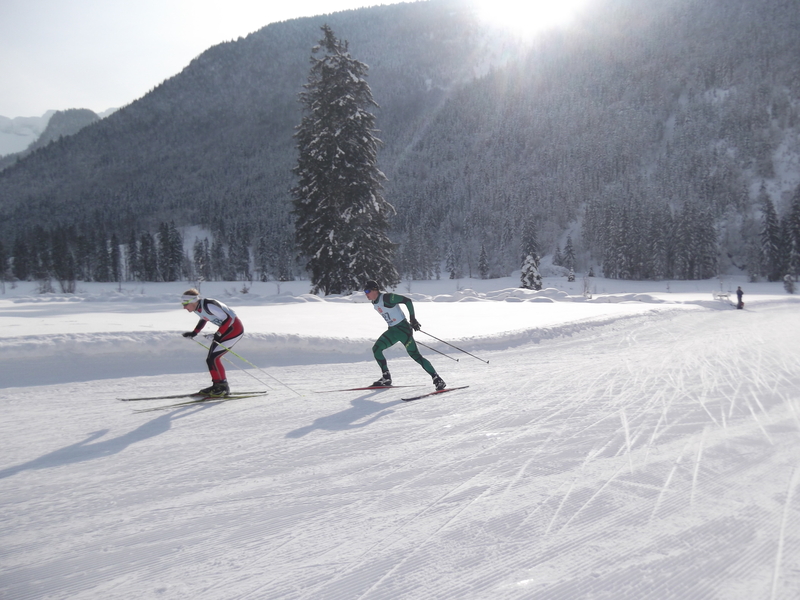 This entry was posted on January 29, 2012 by Phillip Bellingham XC Ski. It was filed under Uncategorized .